This is apparently a slide from a Google engineer highlighting their focus on the user. I don't know who the quote is from but it was tweeted by Paul Frampton the other day. It reminded me of our fourth design principle, do the hard work to make it simple. The second sentence, "If they don't know how to form the query, it's our problem." was one of the reasons we redesigned the homepage a year and a half ago. Users who couldn't get the result they wanted from search, often because they couldn't form the query in the same way we had structured the results, would need to use category style navigation to get what they needed. And it's another reminder that user experience is the responsibility of the whole team. Not just the UX team or the design team. 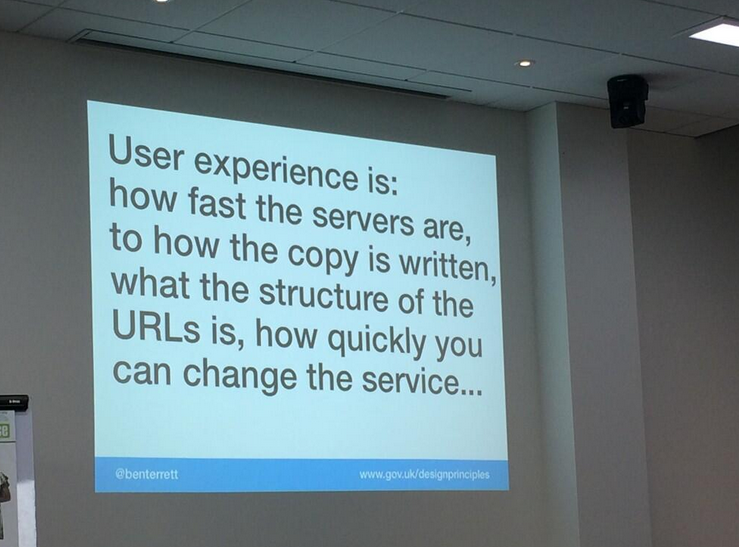 This slide is from a talk Leisa and I gave at Service Design In Government last week. Picture from a tweet by Alberta Soranzo.